Cage systems are the perfect solution for data center environments requiring subdivision or a higher level of security. This concept is a true space-saving way to implement both enhanced security without compromising access for individual, multiple, or enterprise-wide security. Since the system is modular and highly configurable, you can add to it, redo it, or scale it to your needs with minimum hassle. A strong, durable, and attractive cage by Emcor will impress potential clients by showing your attention to quality and security. Panels are built with durable 3/8″ hardware. Once installed, the hardware is not accessible from the exterior. Furthermore, the panels all welded construction, combined with the posts welded base plates, provide unequaled strength and security. Open, but secure, design allows free circulation of air, cooling systems, light and fire suppression systems throughout the secured area. This system is easy to reconfigure as needs change or when adding additional servers. In addition, it does not require level floors and precise alignment like some hook and slot mounting systems. Chateau utilizes standard panels to accomplish nearly any layout. Cage partition panels easily bolt together and are shipped already sized. 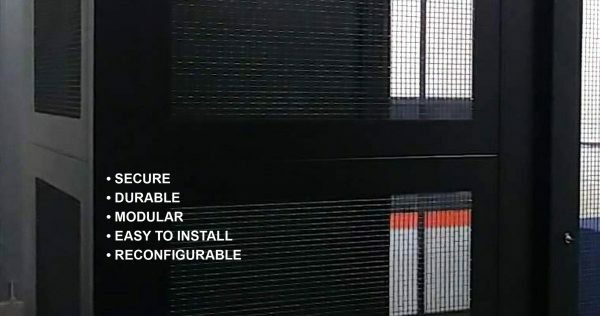 No cutting or grinding is required, so there is no worry about debris infiltrating the air during server cage installation in an operating facility. All necessary hardware is included with your order.